Not many public toilets are listed buildings! The underground conveniences at The Hayes, however, are an exceptional survivor from the Victorian era of rapid city development. 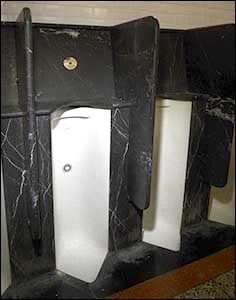 The gents’ toilet retains its original row of ceramic urinals with each stall divided by a structure framed in black marble. 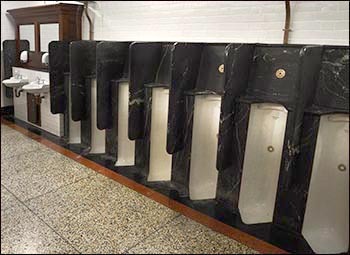 Inside the cubicles are cisterns by Thomas Crapper (1836-1910), an English plumber and sanitary engineer. 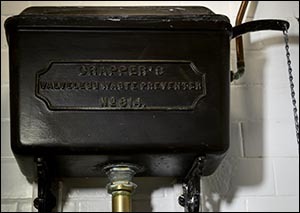 The cisterns, branded as “Crapper’s Valveless Waste Preventer”, are mounted high on the walls and activated by pulling on chains. At street level, ornate ironwork guards the entrances to the toilets. 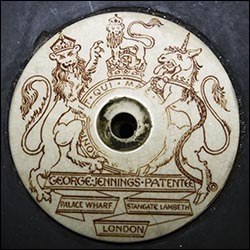 The facilities were officially opened “amid a flourish of trumpets and rattling of gold keys” in August 1898. However, there were problems with the prismatic lights for the toilets. In September 1898, councillors complained that nobody had yet been able to use them and that Cardiff Corporation was paying the staff to do nothing. 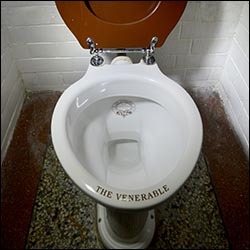 The toilets were restored in 2009 but closed in 2013 to save the city council c.£120,000 a year. They were reopened in 2014 by the owners of the nearby Hayes Island Snack Bar, the history of which is available here.